China National Space Administration has signed a memorandum of understanding (MOU) with the German Space Agency regarding cooperation on the Chang’e 4 lunar probe. MOSCOW (Sputnik) — China National Space Administration has signed a memorandum of understanding (MOU) with the German Space Agency regarding cooperation on the Chang’e 4 lunar probe following the meeting between Chinese President Xi Jinping and German Chancellor Angela Merkel on Wednesday. "Both sides [China and Germany] will follow the path of open, innovative and win-win in their cooperation, deepening their partnership in hi-tech fields of space, smart manufacturing and industrial internet," Xi said at the joint press conference with Merkel. The Chang'e 4 lunar probe, which is expected to be the first human carrying probe landing on the far side of the moon, would be launched in 2018, carrying 11 scientific payloads, including four developed by other countries, according to Liu Jizhong, the director of China Lunar Exploration and Space Engineering Center of China National Space Administration. According to Liu, the Chang’e 5 Lunar probe is expected to land in the Mons Rumker region and to take Moon samples back to Earth at the end of 2017. 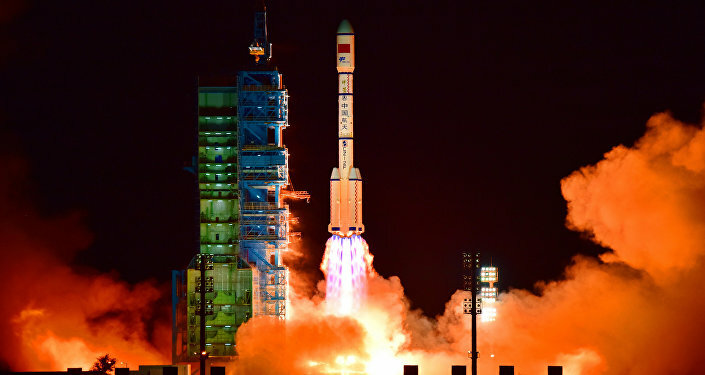 Despite rapid progress in its ambitious space exploration program, China had struggled to borrow experiences from previous successful space missions conducted by space powerhouses such as the United States and Russia. A two-sentence clause included in the US spending bill approved by the US Congress in 2011 prohibits the White House Office of Science and Technology Policy and the US National Aeronautics and Space Administration from coordinating any joint scientific activity with China. Cooperation in space programs between Russia and China improved recently, as both nations looked to build closer bilateral ties. The two countries discussed prospects for cooperation in the field of manned space flights, according to Sergey Krikalev, the executive director for manned space flight programs at Russia's Roscosmos State Space Corporation. Russia's Lavochkin Research and Production Association is ready to work with China on designing Lunar exploration missions, including orbital and return ones, Sergei Lemeshevsky, the company's director general, told Sputnik in early June.